This week we introduce Josh, the store manager at our Red Deer Bone & Biscuit location! 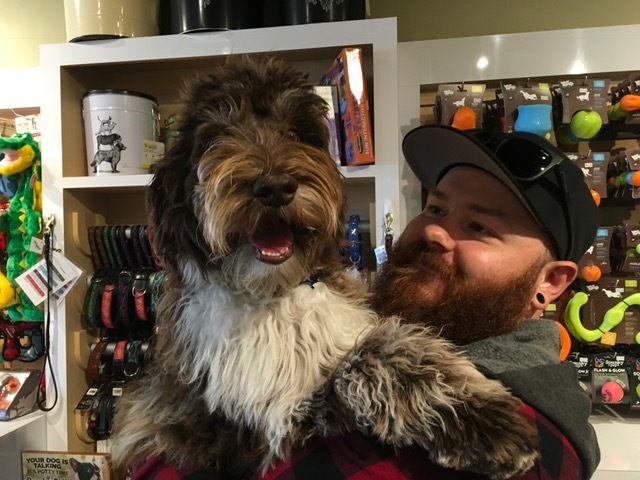 This pet store is family owned and operated in Red Deer Alberta. 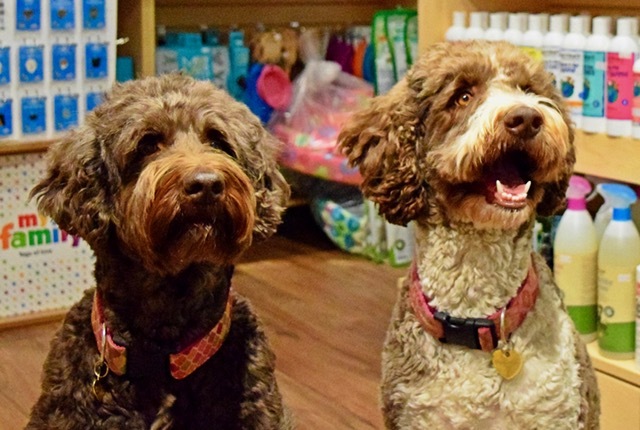 If you stop by you’ll likely be greeted by Reese and Charlie, 2 Goldendoodles that love to hang out in-store. Reese and Charlie are the official dog-treat testers and ensure that all baked goods are up to par! This store opened in March of 2016, we purchased the store and had our Grand Opening in October 2016. ? We have a great location in the Easthill Shopping Center right next to Tim Hortons. We have a great selection of toys, our outdoor gear is popular now, life jackets, water bottles, travel bowls and more! Josh Farrell, and I’m the store manager. 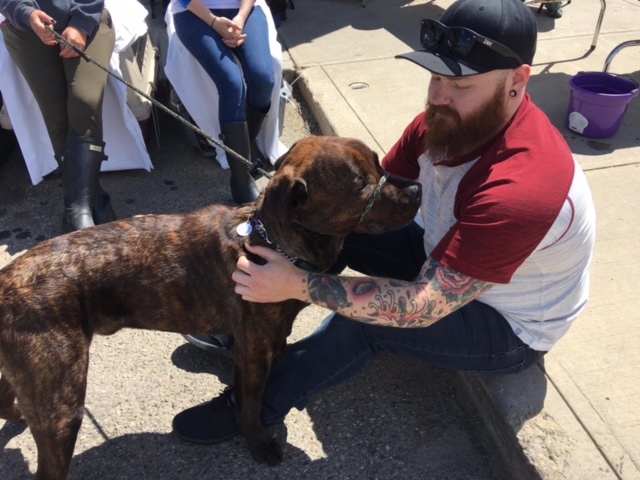 Store manager, Josh, attending a local rescue event. We are family owned and operated. Josh along with his parents, Bill and Candice. We are long time residents in the area and have been involved in the pet industry for over 20 years. We are lucky to have had Carla Powel on board with us from day 1 as well. She has a doggy daycare and is trained in Pet first aid. The Bone & Biscuit Red Deer pet store family! 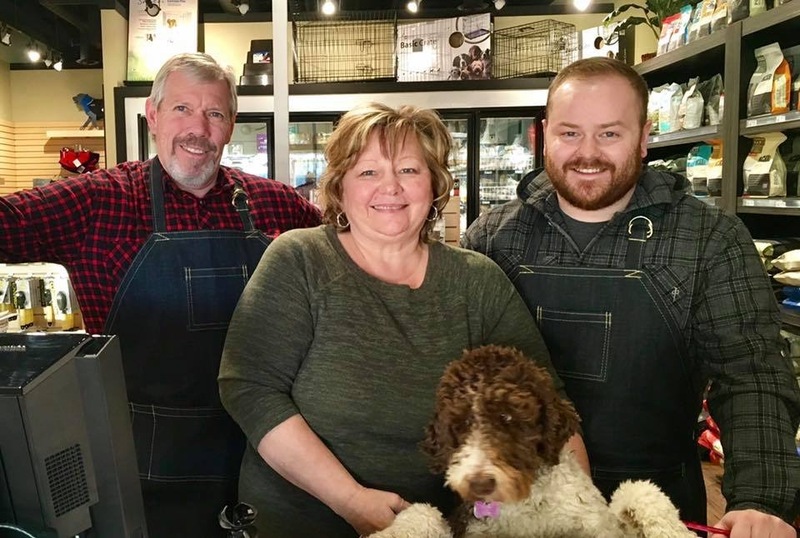 Reese and Charlie, mother and daughter Goldendoodles are store greeters at the Bone and Biscuit Co. they love to meet new people and canine friends and do a pretty awesome job of testing the treats. Our family has always been involved with pets, from grooming and showing to raising puppies we have done it all. This seemed like the right fit for us and we are pleased to offer high quality nutritious food, treats and all the latest accessories to our pet owners. 9. Reese and Charlie hit the jackpot now that you run a specialty pet supply store! What kind of toy or treat do they currently love? Reese and Charlie are Raw fed and right now enjoy Carnivora Lhama patties, it keeps them healthy and their coats look fantastic. Favorite treats are lamb pizzle sticks from Open Range, we had to move them up a shelf! Favorite toy, the Wobble Ball, because it dispenses treats! Oxbows Off Leash Dog Park is close by, we often have pets and their owners stop in for treats, balls or Doggy ice cream on their way to or from the park. Start your new pet off on the right foot with with a raw food diet or a great quality kibble. Healthy treats and toys and games for stimulation are a must as well. Socialization is important as well and we welcome your new fur baby to our store.